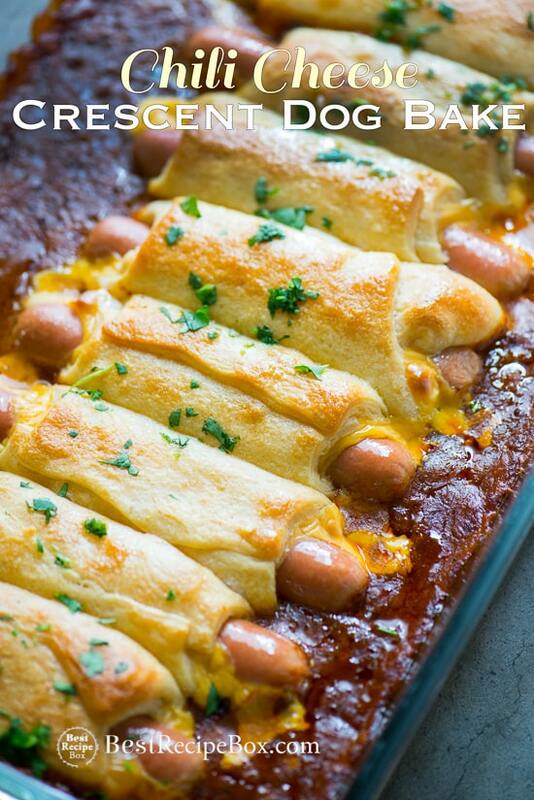 This chili cheese crescent dog bake is ridiculously fun and delicious. At first we thought only the little kiddies would like it, but every single adult that tasted these were blown away at how delicious they were. They just aren’t for Super bowl, game day or special occasions. They’re for every occasion that is a fun gathering and everyone wants to have a good time eating appetizers and beer! Or soda pop! 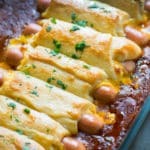 Ok, so it’s super simple to make this chili cheese dog bake. It starts with some simple crescent roll dough. Choose your favorite cheese (we love cheddar and American cheese!). Roll the crescent dough that’s stuffed with a hot dog and a bunch of cheese. Add some of your favorite chili and lots of warm oven love. After about 45 minutes, voila! You can a wonderful warm meal for all chili cheese hot dog lovers! There’s so many different types of hot dogs out there ranging from pork, beef, turkey and even vegan tofu! So you have plenty of options to choose from for this chili cheese bake. The reason why our chili cheese hot dog bake is so popular is because it can serve many people at once. It’s so quick and easy to roll a bunch of cheese and hot dogs in crescent rolls and bake them. In fact, during our taste test, we did two batches at once and it literally took just a few minutes. The problem was we had two huge platters that needed to be eaten! The key is to bake the rolls covered in foil first, then continue baking them without the foil. This ensures that the dough cooks all the way through, leaving you with warm tender crescent dough filled with the best chili cheese dogs on Earth! They’re the perfect appetizer or full meal! More Appetizer-Game Day-Party Recipes and Cheesy Dip Recipes. Make sure to bake the rolls covered in foil first, then continue baking them without the foil. 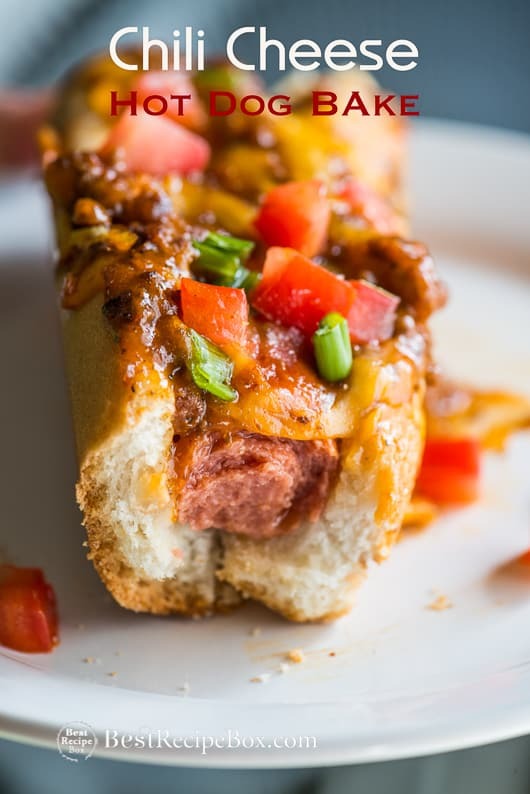 This ensures that the dough cooks all the way through, leaving you with warm tender crescent dough filled with the best chili cheese dogs on Earth! They’re the perfect appetizer or full meal! Love more chili dogs? 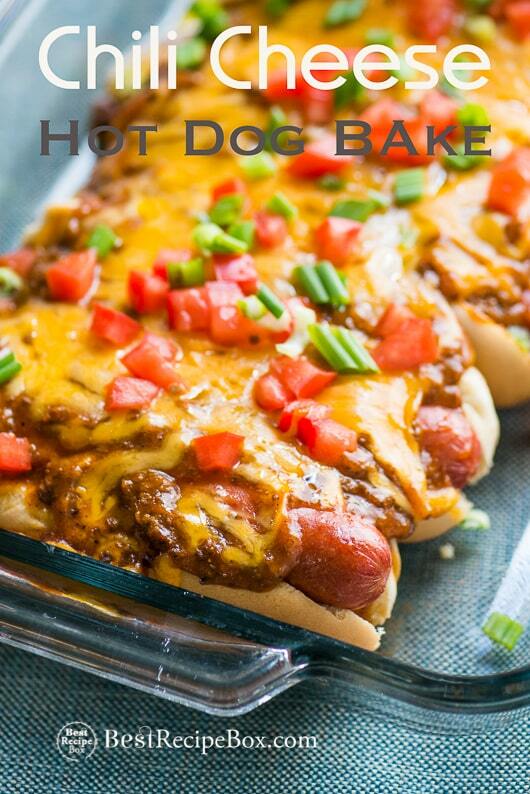 Try our Chili Cheese Hog Dog Bake with regular buns. They’re amazing, easy and just as delicious! Seriously, we can’t decide on which version we like better. Try both of our versions and let us know! OMG chili cheese dog delicious! Perfect for Game Day parties! 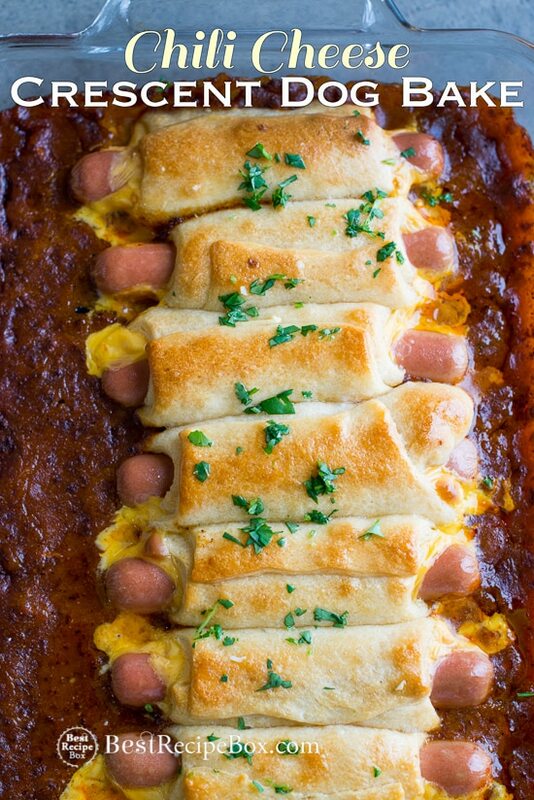 See post above for more recipe details and video making the Chili Cheese Crescent Dog Bake. Preheat oven to 400°F. Rinse hot dogs and pat dry. Open the can of crescent dough and roll out dough. Cut the dough into 8 equal squares. Cover with foil and bake for about 25 minutes. Remove foil, add chili around the base of the hot dogs and continue baking un-covered for about 15 minutes or until tops of dough are golden brown and cooked. Optional- For extra garlic butter goodness, brush remaining garlic butter on top of dough and top with parsley. I don’t remember ever seeing a tube of crescent dough that wasn’t perforated. Where do you buy a tube that is just one big piece of dough that you can cut up like that? We’ll find them next to the tubes of crescent dough. They’ll be labeled as crescent dough sheets. Not all stores have them, but most around us do. They tend to blend in next to the regular tubes of dough. Here’s a link to Pilsbury’s sheets. Pillsbury makes just sheets too they are in the same section you get the Crescent role kind . Not in my state they aren’t! In fact I’ve never seen them in MI,FL or KY! I find the sheets of crescent dough at Publix in Florida. You have to look carefully as the can looks like regular crescent rolls. Thanks for the helpful info so that all our Florida readers can find it! I found it today at Kroger’s..
You can still use the perforated type of dough for this, just pinch the seams together beforehand. Or you could really go the extra mile and use puff pastry sheets. You could even use rolled out biscuit dough if you wanted to. Hope this helps. I have found unperforated sheets of crescent dough at walmart. Seems like Publix keeps them in the freezer. If it isn’t the puff pastry sheets, it’s the pizza dough. I made them with regular perforated dough – not a problem. Didn’t even know they made the other kind and I had been thinking about using the refrigerated pizza dough. Can you prepare the meal ahead of time so you can just slip it in the oven or will there be problems with the dough? Hi Jake- you can bake the hot dogs in the crescent dough first, without the chili. Then when you’re ready to serve, add the chili and bake for about 10-15 minutes or until everything is warm. Like the ease hot dogs . I Will be trying it for dinner. It’s in the oven right now. Smells great! Can’t wait to try them! I’m going to try this tonight with just the regular croissant rolls in a can. Hoping they turn out okay. I made this today since we finally got a nice cool fall day. Perfect. I used crescent rolls (triangle) which worked fine. My cheddar slices were chipotle cheddar from Aldi. Great meal and so easy. Next time I’ll grill some onions to put on the side. What brand of Chili was used? We used 4 different brands while testing and all worked great. Everyone had their own favorites due to personal taste. im doing this with baked beans. Took longer to bake than posted time. Definitely needed 2 cans of chili. Other than that was awesome!! We used my wife’s homemade chilli. Turned out fantastic! I would use Stagg chili the lowest calorie flavor and substitute Hillshire Farms Turkey Polish Sausage to reduce the fat and fine cheese slices that are lower fat, Kraft makes a variety we all like. I would go easy on the butter. Also I am a former Weight Watchers receptionist of 16 years and try to always keep my weight down. I am always trying to cut calories where I can without sacrificing flavor. I am also a type two diabetic for the past eight years. What side dish would go good with this? A refreshing salad would be great! or maybe a coleslaw? We have a great coleslaw recipe. Great recipe the whole family loved! I used reduced fat cresent rolls, veggie hot dogs, 2% cheese and a recipe from Weight Watchers for chili…so a healthier lowfat version. Came out perfect! Wow we didn’t know there was reduced fat crescent rolls. That’s awesome and thanks for the info! I made this for my family and it was good. I would like to try this with low fat hot dogs, cheese, and go sparingly on butter and then make it with the good stuff and see if there’s much of a difference. This looks good I am going to have to try it it looks easy to make plus it doesn’t take long to fix and makes for a fast way to make Lunch or dinner Thank you for sharing this recipe. That’s awesome Daniel that you added some onions! YUM! I am anxious to try these. I am think about adding shredded cheese to top instead of the sliced cheese and then when cooked add relish. Can’t wait. Thanks for sharing. Shredded cheese and relish sounds wonderful Henry! Do you have a recipe for homemade crescent roll dough? I wanna try to make these for my carry-in at work this Friday; is there anything I can use to put them in/or on that’ll keep them warm for a couple additional hours after cooking them? Or would putting them in a crock pot on the “warm” setting work and not ruin them? can you use chili hot dog sauce instead of chili. yes you can use chili hot dog sauce. Hi Karen, The old facebook video shows the older technique. The most recent and better technique is the one that is currently in the video on this page and what is in the recipe box. It shows baking the crescent dogs first and then the chili is added on top later. Enjoy!